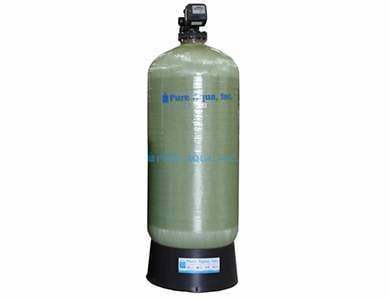 Pure Aqua’s pressure filters clarify water by removing turbidity, unpleasant tastes and odors, sediment, iron, suspended particles, and unwanted color, all of which are commonly found in surface water. Sand is the most common filter media. Generally, fine mesh sand is coupled with a course grain support bed. Anthracite is used in applications where silica pick-up from sand media is undesireable. Activated Carbon is recommended for removing bad tastes, odors, dechlorination, and organic contaminants. Manganese Green Sand is used to reduce iron, manganese and hydrogen sulfide through oxidation. Multimedia is used for maximum water quality when sediment is too small to be removed by standard media. When the filter begins to clog or when the head loss (pressure drop) through the bed increases, flow rates are reduced. To prevent degradation of water quality, the flow is reversed. This is directed by the control valve(s) to drain, carrying with it, the particulate matter that has built up during service. The required flow is specific to the media and is essential to proper cleaning of the media bed. 100C705MM 2.7 4 5.3 4 7X44 0.5 3/4"
100C8075MM 3.5 5.4 7 5.4 8X44 0.75 3/4"
100C910MM 4.4 6.6 8.8 6.6 9X48 1 3/4"
100C1015MM 5.4 8.1 10.8 8.1 10X54 1.5 3/4"
100C1220MM 7.8 11.7 15.6 11.7 12X52 2 1"
125C1325MM 9.2 13.8 18.4 13.8 13X54 2.5 1"
125C1435MM 10.7 16.1 21.4 16.1 14X65 3.5 1-1/2"
125C1645MM 13.9 20.9 27.8 20.9 16X65 4.5 1-1/2"
150C1855MM 17.7 26.6 35.4 26.6 18X65 5.5 1-1/2"
150C2175MM 24.1 36.2 48.2 36.2 21X62 7.5 1-1/2"
150C24100MM 31.4 47.1 62.8 47.1 24X72 10 1-1/2"
200C30150MM 49.1 73.7 98.2 73.7 30X72 15 2"
200C36210MM 70.7 106.1 116.2 106.1 36X72 21 2"
200C42280MM 96.2 116.2 125 125 42X72 28 2"
300C48400MM 125.7 188.6 250 188 48X72 40 3"
100C705AG 2.7 4 5.3 4 7X44 0.5 3/4"
100C8075AG 3.5 5.4 7 5.4 8X44 0.75 3/4"
100C910AG 4.4 6.6 8.8 6.6 9X48 1 3/4"
100C1015AG 5.4 8.1 10.8 8.1 10X54 1.5 3/4"
100C1220AG 7.8 11.7 15.6 11.7 12X52 2 1"
125C1325AG 9.2 13.8 18.4 13.8 13X54 2.5 1"
125C1435AG 10.7 16.1 21.4 16.1 14X65 3.5 1-1/2"
125C1645AG 13.9 20.9 27.8 20.9 16X65 4.5 1-1/2"
150C1855AG 17.7 26.6 35.4 26.6 18X65 5.5 1-1/2"
150C2175AG 24.1 36.2 48.2 36.2 21X62 7.5 1-1/2"
150C24100AG 31.4 47.1 62.8 47.1 24X72 10 1-1/2"
200C30150AG 49.1 73.7 98.2 73.7 30X72 15 2"
200C36210AG 70.7 106.1 116.2 106.1 36X72 21 2"
200C42280AG 96.2 116.2 125 125 42X72 28 2"
300C48400AG 125.7 188.6 250 188 48X72 40 3"
100C705AC 1.9 2.1 3.2 3.2 7X44 0.5 3/4"
100C8075AC 2.5 2.8 4.2 4.2 8X44 0.75 3/4"
100C910AC 3.1 3.5 5.3 5.3 9X48 1 3/4"
100C1015AC 3.8 4.3 6.5 6.5 10X54 1.5 3/4"
100C1220AC 5.5 6.2 9.4 9.4 12X52 2 1"
125C1325AC 6.4 7.4 11 11 13X54 2.5 1"
125C1435AC 7.5 8.6 12.8 12.8 14X65 3.5 1-1/2"
125C1645AC 9.7 11.1 16.7 16.7 16X65 4.5 1-1/2"
150C1855AC 12.4 14.2 21.2 21.2 18X65 5.5 1-1/2"
150C2175AC 16.9 19.3 28.9 28.9 21X62 7.5 1-1/2"
150C24100AC 22 25.1 37.7 37.7 24X72 10 1-1/2"
200C30150AC 34.4 39.3 58.9 58.9 30X72 15 2"
200C36210AC 49.5 56.6 84.8 84.8 36X72 21 2"
200C42280AC 67.3 77 115.4 115.4 42X72 28 2"
300C48400AC 88 100.6 150.8 150.8 48X72 40 3"
100C705BM 1.9 2.1 3.2 3.2 7X44 0.5 3/4"
100C8075BM 2.5 2.8 4.2 4.2 8X44 0.75 3/4"
100C910BM 3.1 3.5 5.3 5.3 9X48 1 3/4"
100C1015BM 3.8 4.3 6.5 6.5 10X54 1.5 3/4"
100C1220BM 5.5 6.2 9.4 9.4 12X52 2 1"
125C1325BM 6.4 7.4 11 11 13X54 2.5 1"
125C1435BM 7.5 8.6 12.8 12.8 14X65 3.5 1-1/2"
125C1645BM 9.7 11.1 16.7 16.7 16X65 4.5 1-1/2"
150C1855BM 12.4 14.2 21.2 21.2 18X65 5.5 1-1/2"
150C2175BM 16.9 19.3 28.9 28.9 21X62 7.5 1-1/2"
150C24100BM 22 25.1 37.7 37.7 24X72 10 1-1/2"
200C30150BM 34.4 39.3 58.9 58.9 30X72 15 2"
200C36210BM 49.5 56.6 84.8 84.8 36X72 21 2"
200C42280BM 67.3 77 115.4 115.4 42X72 28 2"
300C48400BM 88 100.6 150.8 150.8 48X72 40 3"
100C705CF 1.9 2.1 3.2 3.2 7X44 0.5 3/4"
100C8075CF 2.5 2.8 4.2 4.2 8X44 0.75 3/4"
100C910CF 3.1 3.5 5.3 5.3 9X48 1 3/4"
100C1015CF 3.8 4.3 6.5 6.5 10X54 1.5 3/4"
100C1220CF 5.5 6.2 9.4 9.4 12X52 2 1"
125C1325CF 6.4 7.4 11 11 13X54 2.5 1"
125C1435CF 7.5 8.6 12.8 12.8 14X65 3.5 1-1/2"
125C1645CF 9.7 11.1 16.7 16.7 16X65 4.5 1-1/2"
150C1855CF 12.4 14.2 21.2 21.2 18X65 5.5 1-1/2"
150C2175CF 16.9 19.3 28.9 28.9 21X62 7.5 1-1/2"
150C24100CF 22 25.1 37.7 37.7 24X72 10 1-1/2"
200C30150CF 34.4 39.3 58.9 58.9 30X72 15 2"
200C36210CF 49.5 56.6 84.8 84.8 36X72 21 2"
200C42280CF 67.3 77 115.4 115.4 42X72 28 2"
300C48400CF 88 100.6 150.8 150.8 48X72 40 3"